Woohoo! We are so excited to get this season off to a start! For this first week, we asked the designers to use buttons to highlight their looks. Make sure to check them all out before voting (below). 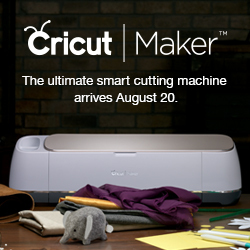 If you want to see more of one particular design, you can click over to their individual blogs for more details. Hello everybody! I'm pretty excited to finally be here and showing you what I have for our theme of Buttons! This is going to be tricky to keep short so you'll have to go check my blog by clicking this link for the details. I will spare you none!.... What I will tell you here is that for this week I started with only these overalls and this blouse in mind. Neither are splattered in buttons, but rather the buttons compliment and are quite necessary for these pieces. I traded in the knot style feature on these overalls for these nifty little button details and it was exactly the change I felt they needed. 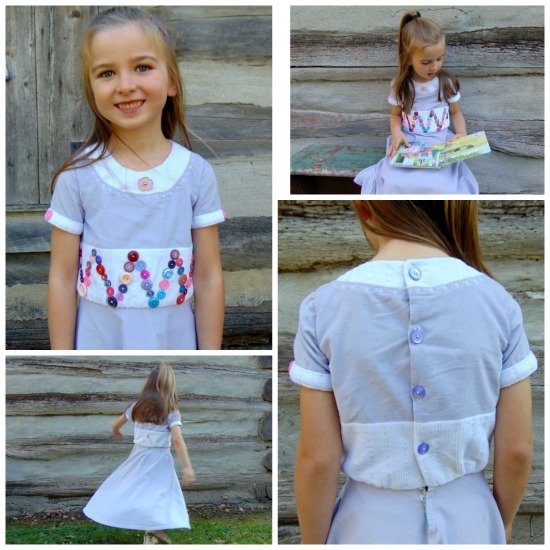 For the blouse, it's an altered Simple Life pattern that already has that button placket down the back making it a perfect starting point. I took the opportunity to give it a nice scalloped neckline and switch up the sleeves by adding those gorgeous ruffles. Then I decided that I wanted to feature a few more buttons and so began the search through my sewing room for a second look. You'll notice I kept the look cohesive by continuing with the denim/faux leather look which came from a pile of old jeans in my stash. And you might notice the bottom ruffle of the skirt matches the sleeves on the blouse. Well, that would be a old dress of mine that I chopped the top off of . It was my inspiration for those sleeves even before I realized how cool it would look on this modified Zephyr Dress by Lil Luxe. I topped it off with a pretty necklace that is covered in buttons! Beautiful ones. That one is a pattern from Violette Fields. Oh, and the buttons in the hair? My daughter specifically asked for that and I happily obliged! I am so excited to be here for week one of Project Run and Play! I will admit that when I found out the theme for the first week, I was a little nervous because buttonholes and I do not always get along! However, I was determined to not let the buttonholes win! 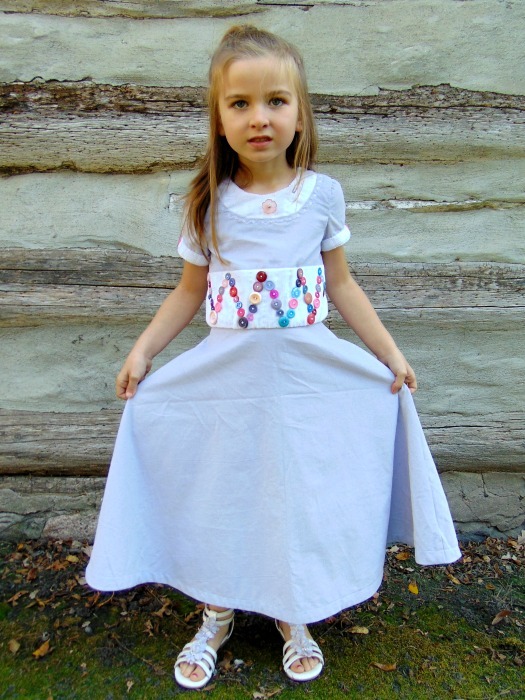 I started with the Ila dress bodice from Coffee and Thread patterns. I cut length from the bodice to add a waistband. I wanted a belted look, but a waistband suits my five year old sister best. I drafted a simple half circle skirt using my sister's waist measurement. I started with this tutorial from Dana Made It, but cut a half circle instead of a full circle. Now, on to the buttons. I wanted to make the buttons into a zigzag shape for two reasons - I like how it looks and my sister's name is Veronica - so the "Vs" in the zigzag are for her name! She is in kindergarten and knows her letters, so it is perfect! Since the front is pretty detailed, I went with some simple buttons for the back. There are 54 buttons total on the dress! Head on over to my blog here for more details and pictures about my look! The pants are based on the Jalie Eleonore pull on jeans. I added functional buttons to the outside leg. Closed, the pants have a straight leg. Open, they look more like a flare and provide ventilation for warmer afternoons. The button and thread colors match the shirt. 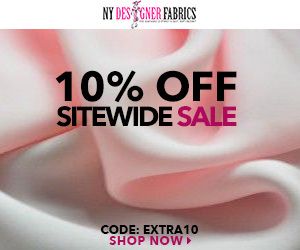 I used a comfortable rayon ponte that refuses to press so every single seam is topstitched. The shirt is based on the Oliver + S Building Block Dress, very heavily modified. Basically, I only kept the armscye, the sleeve cap, and the shoulders! The back and underside of the sleeves are made from knit for extra ease of movement, while the rest is woven. I made small dorset buttons for the cuffs and bigger ones for the button band at the front. A few of the buttons are functional but the rest is decorative, inspired by one of my own cardigans! Please visit me at deuxsouriceaux for more information. There is so much more I want to say about this look! Hello, everyone! 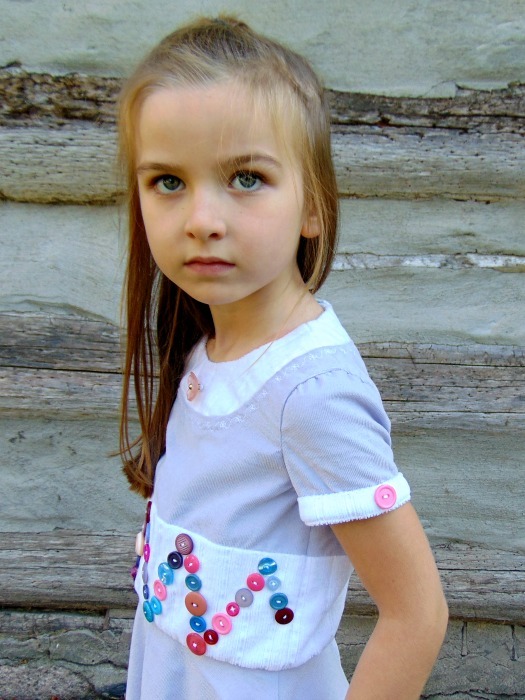 For the button challenge, I chose to make Eliza three pieces with button closures, using them to add pops of color and detail. 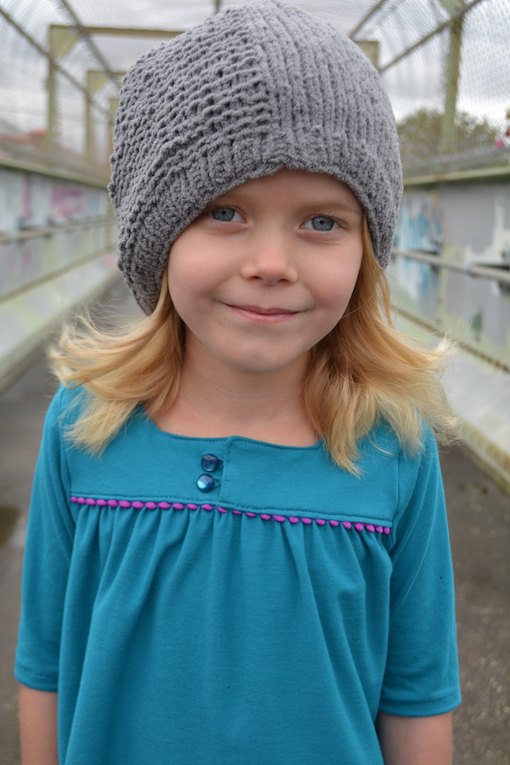 The knit top is self-drafted based on an old favorite shirt of Eliza's. The trench coat started with the Sunki Dress by Figgy's, and I kept only the side pockets and pleated sleeves. (I used the same pattern and similar modifications for Flip This Pattern back in 2013. I didn't keep my original, so I had to start from scratch on this one! It was Eliza's most-worn garment with buttons, so it was worth recreating.) The skirt is the Ayashe by Figgy's, and I modified it by adding knit shorts under for modesty and warmth. The knitted hat is the Barley by Tin Can Knits. All fabric, trim, and buttons came from Let's Sew, our local fabric store. Hop over to my blog, Handmade Martini, for more pictures and details! Thank you! Hey all! 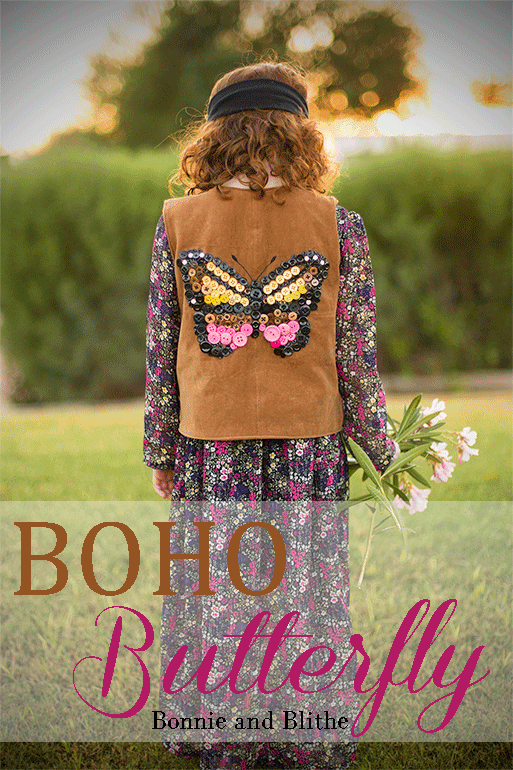 I'm excited to share my week 1 look with you: I call it Boho Butterfly! 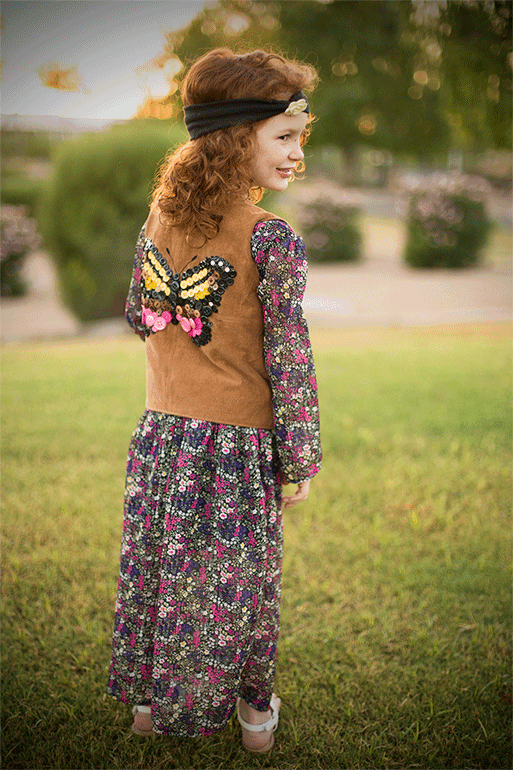 I knew I wanted to create button art for this challenge and when I thought of using a butterfly as my subject, the rest of this bohemian-themed look just fell into place. I used a faux suede for this vest, based on Jennuine Design's moto jacket pattern and I love how it looks both zipped up and open. The dress was based on my Infinite A-line Dress pattern only with a lengthened skirt and fuller sleeves. 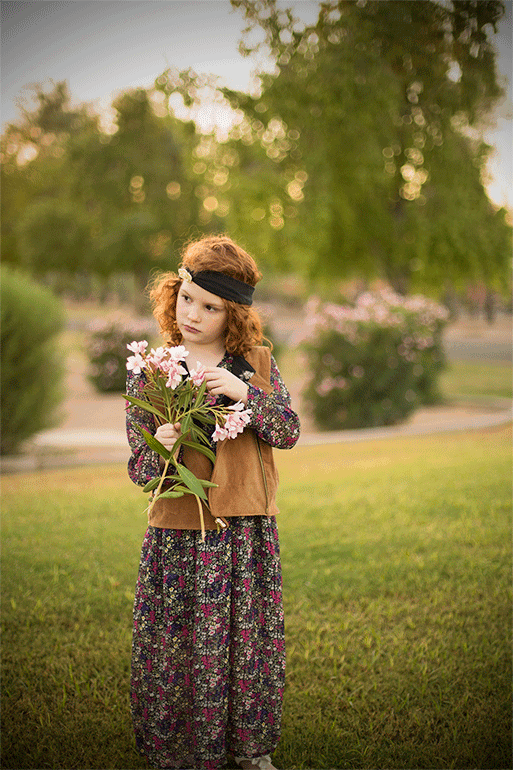 This chiffon dress just says "let's go frolic in the forest and befriend woodland creatures" to me :) I love the flowy factor, the floral pattern and the ease of wear. I considered adding some ruffles to the sleeves and hem but decided against it since the vest is such a statement piece. I lined the bodice and half the skirt with a rayon, but the sleeves and bottom of the skirt are fairly sheer. 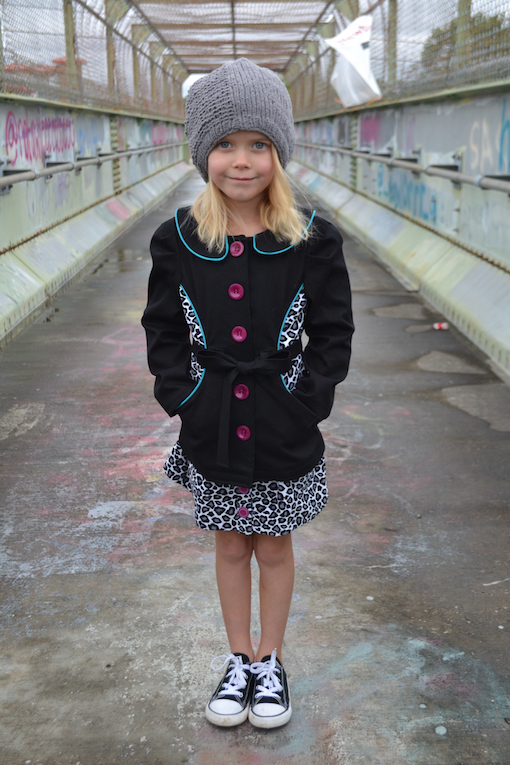 Both my little model and her twin are obsessed with it and fought over it all weekend! Visit my blog for even more behind-the-scenes details of this look, including a very sad story about a naughty toddler, a pair of scissors and why I almost dropped out! Hey, you don't know me, I'm Teronia from Sew Haute Blog. This is my first time and first week on Project Run and Play and I can't believe I'm actually here! It's like wearing the suit of your favorite hero, but enough dramatics, let's get to this week's look. This week we we were challenged to highlight our work with buttons. I wanted to do something that wasn't just throwing buttons at my outfit. I'm not super artsy so carefully arranging an array of buttons that look like the Mona Lisa just wasn't in my cards. Instead I opted for functional buttons. This involved me inventing, YES INVENTING, a partial button placket and sort of drafting my own waistband to get the sailor pants look that I wanted. All of this so that I could have functional, purposeful buttons. I based my top off of the Blank Slate Fresh Bloom Frock. 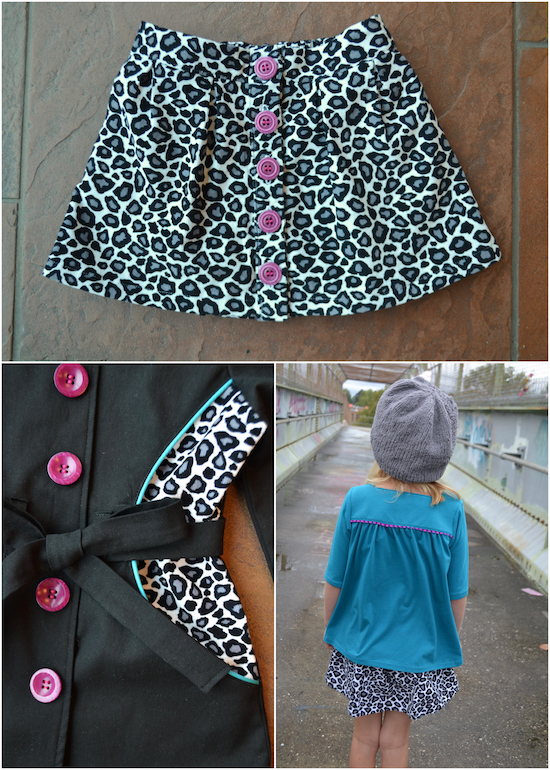 It has a gorgeous feature button on the shoulder, but I wanted to step up my button game so I moved the first button down and took that placket that I invented (wink) down the front side to add more buttons and functionality, otherwise my daughter's head would not fit. I also changed the collar shape and position and turned the dress into a tunic, eliminating the separate bodice and skirt. The pants are based off f the Jalie Eleonore Pull On Jeans. I added a tuxedo stripe to give the outfit an outdoorsy feel. I was also inspired by another pattern and changed the waistband to the sailor style. 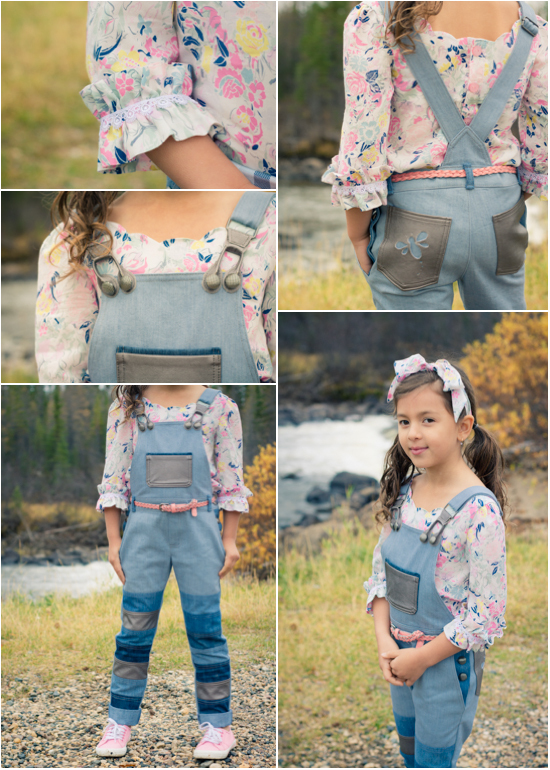 If you'd like more details about the fabric, patterns and the overall look you can hop on over to my blog: Sew Haute Blog. If you do don't forget to come back here and vote for your favorite look. Keeps scrolling for the voting polls. Thanks for visiting! WOW!!! Awesome job, everyone! I can tell that everyone put an enormous amount of time and effort into these looks. So many great details! What amazing work and great details!!!!! Great job to all!!! This was a tough one! Beautiful work, Ladies! Wow! This is why I love Project Run and Play Competitions. Everyone steps up their game, and the creative ideas that flow from doing your very best is amazing. All the outfits look amazing! It was difficult to choose just one.